Motor yacht PRESTIGE 420 opens the Fly model line of the PRESTIGE brand. Contemporary timeless lines of the yacht’s exterior design highlight the unmissable style of The Garroni Design. A bright open living space settles on the main deck of the yacht. The spacious raised saloon greets guests with fully equipped galley and an incredible view opening through 360 degrees’ panoramic windows. The smart planning of the living zone allows PRESTIGE 420 to combine the social saloon with the private cabin space. The yacht offers two cabins with separate entrance, which is an exquisite feature for any 42-footer. A central master cabin equipped with private en suite facilities occupies the full width of the hull creating more intimate space for its owners. The interior design of the cabins is traditionally crafted by The Garroni Designs. The light fly bridge gives enough spaces for relaxing sunbathes, making PRESTIGE 420 flybridge a perfect yacht for a summertime cruising. A special attention should be paid to the hull design, which is a result of smart planning conducted by Jernej Jakopin. The Prestige 420 motor boat is an epitome of elegant surpassed look and impeccable technical features. IPS pod drives are hidden under the hull, freeing a bonus space for the living zone. This new PRESTIGE 420 for sale is equipped with Volvo Penta IPS 400 engine to deliver a truly impressive level of maneuverability. 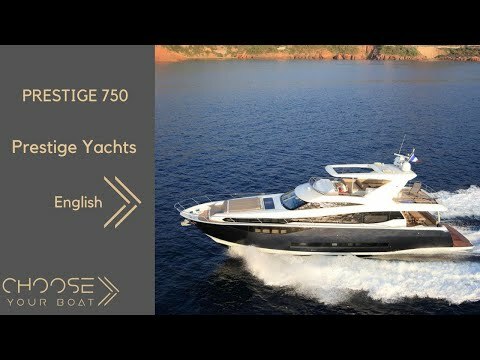 Besides its impressive design and technical features, PRESTIGE 420 goes for sale for a very reasonable price as for a fly motor boat of this range.